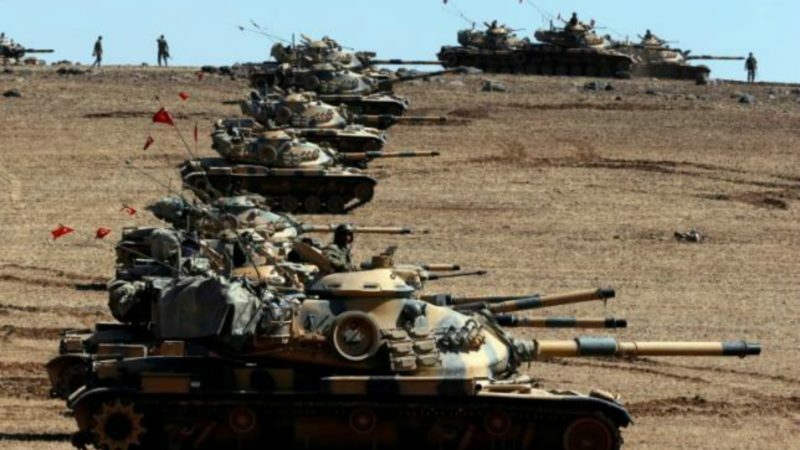 Turkey’s long-anticipated incursion into Syria has begun, exactly 500 years after the Battle of Marj Dabiq, near Aleppo, heralded the Ottoman conquest of much of the Middle East. With Kurdish People’s Protection Units (YPG) surging across Aleppo province, it was only a matter of time before Ankara increased its involvement in the Syrian civil war (though various hiccups forestalled its entry into the country). Even as its troops cross the border into Syria, however, Turkey’s role in the conflict remains constrained by the risks inherent in the war and by its own weaknesses. Instead of a daring charge into Syria, Turkey has made a carefully calibrated entrance. As with any military campaign, Turkey’s incursion into Syria is risky. For one thing, going into Syria will ramp up Turkey’s military conflicts with the Islamic State and the YPG. For another, in sending its troops across the border, Turkey is entering a territory whose nominal government is a longtime enemy and whose powerful foreign backers actively target the rebel fighters Ankara supports. Turkey is also hobbled by domestic problems, including a raging Kurdish insurgency and the recent failed coup and subsequent purge, both of which have diminished its qualitative military strength. At the same time, the country has several important advantages that will serve it well in Syria. Ankara already benefits from its long-standing ties with Syrian rebel groups aligned with its interests. For the most part, the groups are Free Syrian Army units, which make up the bulk of the new offensive, named Operation Euphrates Shield. Turkey can rely on its ample stores of powerful artillery and fighter bombers to strike at Islamic State — and potentially YPG — targets without having to put too many of its own forces into direct combat. Diplomacy also played its role, laying the groundwork for the offensive. In preparation for its expanded involvement, the Turks diplomatically engaged their previous adversaries. Turkey’s talks with Russia and Iran did not resolve their underlying differences on Syria. Nonetheless, they facilitated greater Turkish involvement in the conflict while also lowering the risk of a clash with either country or the Syrian loyalist forces they back. The increased participation of the Turkish air force in Operation Euphrates Shield, for instance, suggests that Ankara’s conciliatory efforts with Moscow defused Russia’s standing threat to shoot down any Turkish aircraft flying over Syrian airspace. More important for Turkey’s goals in Syria, though, is the country’s relationship with Washington. Notwithstanding the recent tension between the United States and Turkey, heightened by the attempted coup, the Turks understand that their alliance with NATO and the United States provides an invaluable safety net. Considering their fundamental differences, Turkey cannot presume that diplomacy will be enough to prevent a confrontation with Russia in Syria. And in light of the many things that could go wrong in its military campaign in Syria, cooperation with the US military is a veritable lifeline for Turkey. Even the close relationship between the United States and the YPG-dominated Syrian Democratic Forces, long a source of ire for the Turks, has its benefits for Ankara. Having enhanced its support for rebel offensives on Islamic State positions, Turkey can use its redoubled efforts against the militant group to press Washington on stopping further YPG advances in Aleppo. This approach already seems to be working; the Syrian Democratic Forces recently announced that they would halt further operations toward Jarabulus. Moreover, in his visit to Turkey on Wednesday, US Vice President Joe Biden warned the YPG that the United States would withdraw its support if the group does not pull back east of the Euphrates. In that case, the Syrian Democratic Forces would be much less able to compete with the Turkish-backed rebels in the race for al-Bab. As Turkey steps up its involvement in the Syrian conflict, it must be careful to avoid the pitfalls that could expose its weaknesses. Under its current circumstances, Turkey cannot rely solely on military force to manage its tricky yet seemingly inevitable intervention. Though its NATO membership and its many local rebel allies will benefit Turkey in its Syrian campaign, Ankara cannot rest easy. The dangers of being drawn deeper into a quagmire in Syria are as great as ever. Now that Turkey is betraying its friend ISIS, will this lead to more attacks by ISIS in ISTANBUL. Why the US hasn’t cut Turkey lose is anyone’s guess. What a strange perspective to refer to Turkey as a friend of ISIS when ISIS has launched multiple devastating terrorist attacks on Turkey. Turkey has contributed to the campaign against ISIS in multiple ways. Turkey’s foray into Syria is consistent with its past policy of supporting the anti-ISIS campaign. What an odd statement “Why the US hasn’t cut Turkey lose is anyone’s guess.” Turkey has been an ally of the US for decades. On some matters there have been differences, but the alliance remains strong. Now that Turkey has entered Syrian territory to bring the war to ISIS we can expect ISIS to lose all remaining territory in Iraq and Syria in the coming months. At that point Turkey’s perspective will also become relevant in the coming political resolution in Syria.